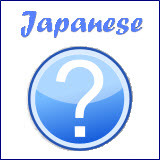 In this section you will get to learn to write Japanese hiragana of the remaining 21 characters. 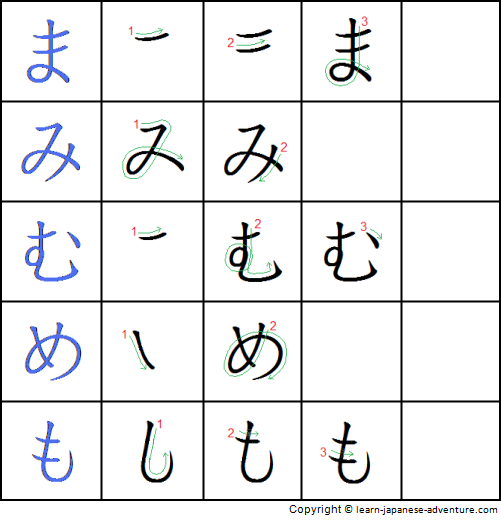 Click here to see how to write the first 25 hiragana characters. Similarly, in the subsequent diagrams that you are going to see, the first character on the left in each row shows the full hiragana character. The subsequent columns show you the strokes in the correct order. Memorize how each character is written by following the green line of each stroke. After some practices, learn to write each character without looking at the diagram. Take note of the correct writing of some similar characters like る (ru) and ろ (ro). Most people made mistake at the end of the stroke. While る (ru) has to curve in at the end of the stroke, ろ (ro) do not need to curve in. The following diagram shows how to write hiragana characters は (ha), ひ (hi), ふ (fu), へ (he) and ほ (ho) in the correct order and strokes. The following diagram shows how to write hiragana characters ま (ma), み (mi), む (mu), め (me) and も (mo) in the correct order and strokes. 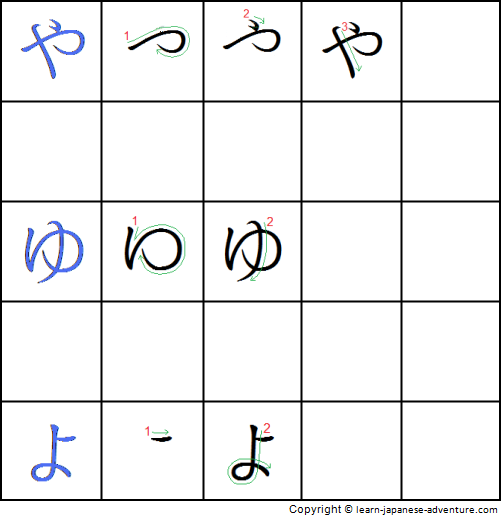 The following diagram shows how to write hiragana characters や (ya), ゆ (yu) and よ (yo) in the correct order and strokes. The following diagram shows how to write hiragana characters ら (ra), り (ri), る (ru), れ (re) and ろ (ro) in the correct order and strokes. 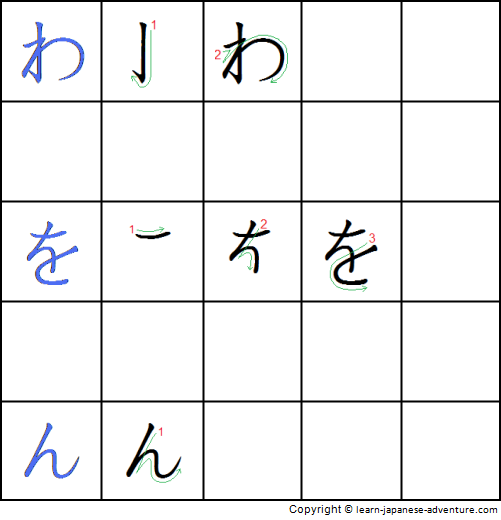 The following diagram shows how to write hiragana characters わ (wa), を (wo) and ん (n) in the correct order and strokes. 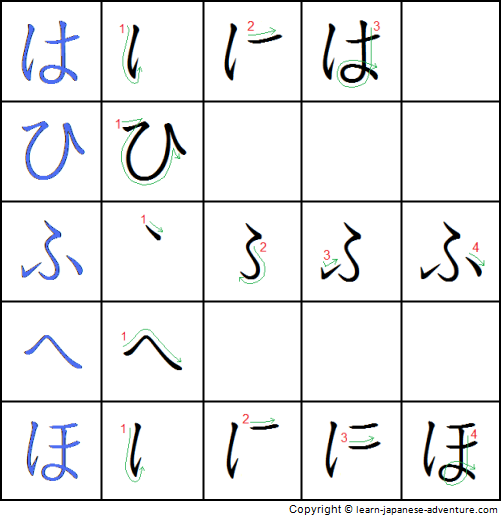 Do more practices and you will soon find that you can write all the 46 hiragana characters in no time. 1. 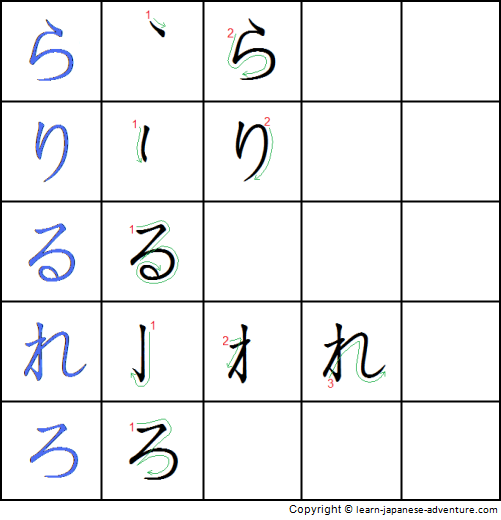 Learn to write hiragana in the a-line, ka-line, sa-line, ta-line and na-line. 2. 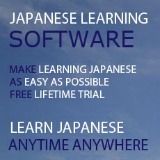 Learn to write katakana in the a-line, ka-line, sa-line, ta-line and na-line. 3. 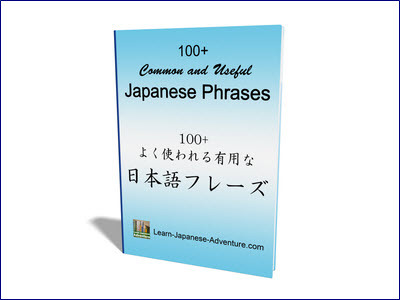 Learn to write katakana in the ha-line, ma-line, ya-line, ra-line, wa, wo and n.
To know more, I recommend you take a look at this book on hiragana.